This weekend I encountered something a little strange for me: I’ve promoted some free development gifts to my audience to help my peeps start 2015 with a bang and actually the servers “melted” due to high demand. I offered 7 wealth building ebooks and the replay to the Aundance Blocks Clearing session presented in January to +80,000 live online attendants. call it my own ambition to do it by myself. So here’s the download page – everything is 100% free just please use the info. Remember: “Information is just potential power. It becomes power when actually it is applied”. So, giving, giving, giving for today: http://mindsetoptimizer.net/f-n-d browse, download everything, use and apply! Also I was asked why I pay so much attention to personal development and if I really resonate with the resources I’m sharing. The truth is that when I write about something related to personal development usually it is something already tested on my end. I really believe that everybody has the right to live life to the fullest and I’m doing my best to impact positively as many lives possible with everything I do. So … I have the skin in the game. Christie’s post-Masterclass sale on the Unlimited Abundance Program ended last Wednesday. BUT… due to numerous requests from fans… She’s re-opening it with an incredible new trial plan that’ll be available for next 3 days. See the full details here! This is a special trial plan where you get to try a portion of the whole program for a no-brainer price. You’ll LOVE this new plan. 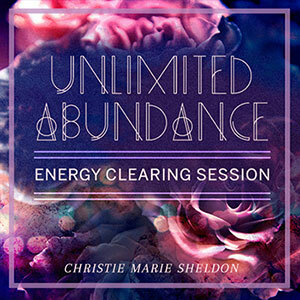 Remember, Christie usually charges anywhere from $97 to $197 for specialized energy clearing on Abundance Blocks. But with this NEW plan you’re getting it for less than $5 per hour of clearing. Yes, it’s THAT low. Christie’s doing this just so more people can experience how these clearing actually bring down your Abundance Blocks and see how that leads them to manifesting more wealth FAST. Even though the price looks so low, you’re getting the best reviewed product… that created an insane number of success stories so far. Go here to get in on the Unlimited Abundance Trial program. Previous Previous post: Why Bob Proctor believes that the Law of Attraction is incomplete? Next Next post: How I plan to add more webinars in 2015?